With the end of the season nearing, I was keen to take in as many games as possible. Normally I'll do a game on Tuesday, Friday and Saturday but with 4am starts at work every morning, I usually used the other nights to catch up on sleep. But I decided I fancied a game on the Wednesday or Thursday so after getting the non league paper on Sunday I texted Chris & Anwar with a list of games. Chris came back with Holbrook Sports, Walsall Wood and Borrowash Victoria as the games that he fancied. 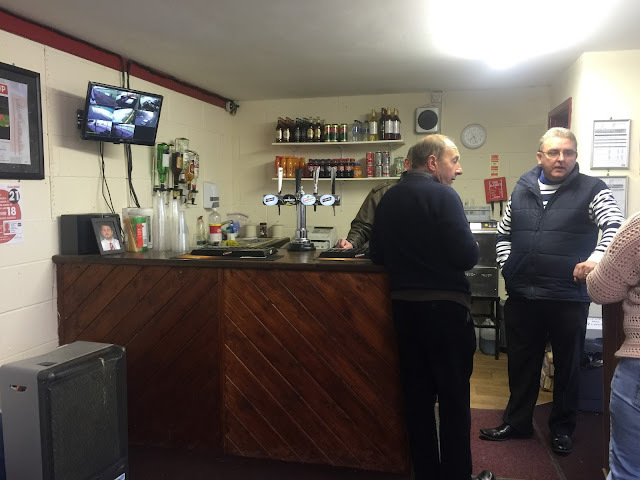 After my usual research of seeing if there was a chance of decent pre match pint near the ground I selected Borrowash Victoria as it had a decent looking place called The Drapers Arms which did good value food as well. I'd been to the ground before to have a look around back in 2007 before Wycombe's game at Chesterfield and was pretty impressed with the ground for the level. The only other thing I knew about the place was that my Barrow supporting mate John was born and lived there before moving up to Cumbria. 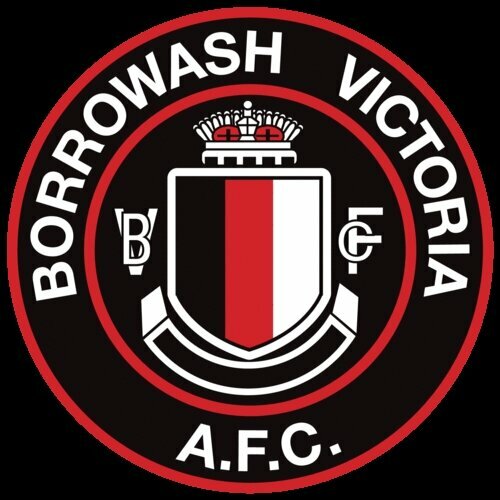 BORROWASH VICTORIA were formed in 1911 and were members of the Long Eaton & District Church League. They folded in 1957 before being resurrected in 1963. Joining the Midland League in 1979 they were champions in only their second season. They joined the NCEL as founder members and the success continued with a promotion and top 3 finishes in 3 out of their 4 seasons spent there. In 1986 they joined the Central Midlands League and gained their best ever finish of 5th in their first season. It was back to the NCEL in 1995 with them starting in Division 1, with them winning the league in 2001 to gain promotion to the Premier Division. 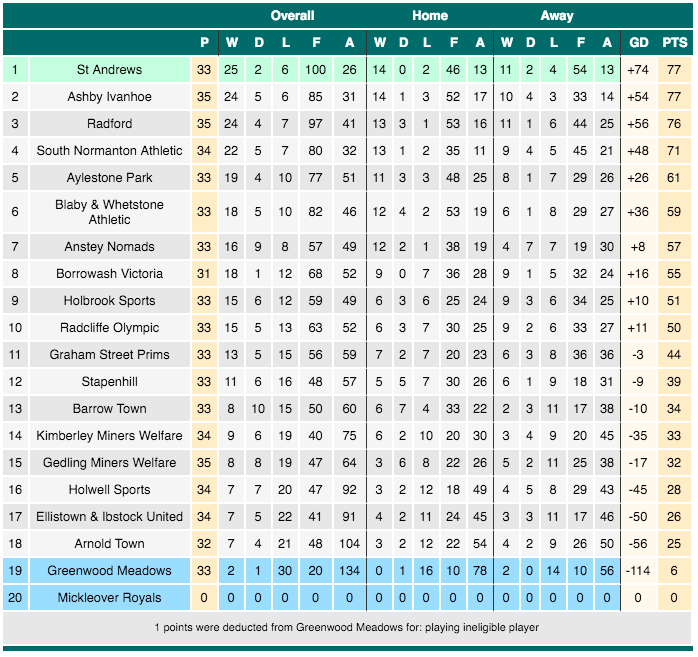 16th place in their first season remians their best ever finish in the current pyramid system but by 2005 they were relegated back to Division 1 after a few seasons of struggle. They transferred to the East Midlands Counties League in 2008 and finshed as runners up in 2011 and 2012, just missing out on promotion. Last seasons 16th place was much improved on this season with them sitting in 8th and with games in hand on other teams after the previous weekends games. In the FA Cup the clubs best run came in the 1991/92 season. After beating St Helens Town & Belper Town before handed a seemingly tricky tie at Conference side Macclesfield Town who had beaten league runners up Wycombe Wanderers twice that season. However they gained a memorable victory at the Moss Rose before going on to lose to Emley in the 3rd Qualifying Round. The FA Vase has also seen some good runs with them reaching the 4th Round on 3 occasions. 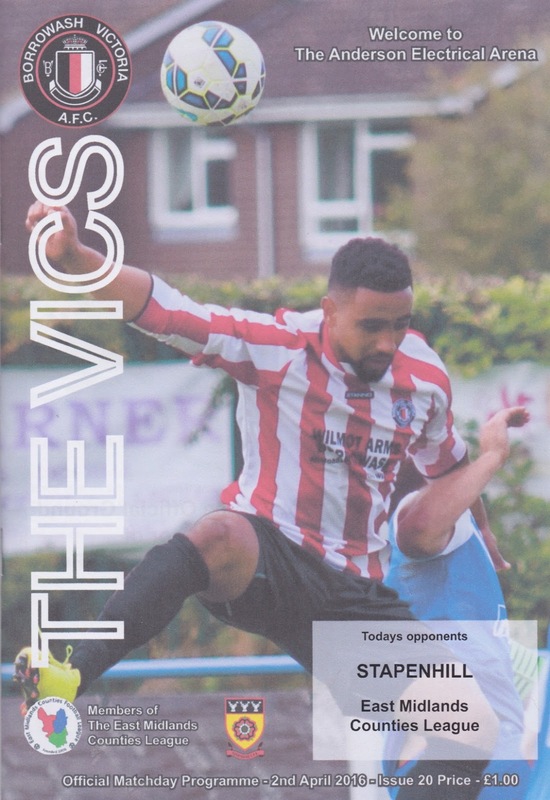 The last of these was as recently as 2013 when they lost out to Ascot United. They have also won the East Midlands Counties Cup twice. Despite the name Borrowash Victoria are actually located in the adjacent suburb of Spondon, right next door to local rivals Graham Street Prims with the 2 clubs sharing an access road. Since my last groundhop on Friday I’d had the misfortune of 2 Wycombe games. Both were disappointing and dour draws.Firstly on Saturday we drew 1-1 with Barnet, surrendering our lead and looking second best throughout. Then on Tuesday we drew 0-0 at home to lowly Yeovil and it was the usual limited range of chances. So much so that in 2016 we have scored just 13 goals in 22 games and it doesn’t look like changing any time soon. Because of that I was once again looking forward to doing some ground hopping in what had otherwise been a pretty uneventful week. On the day I worked from 5-12 before coming home and expecting to find the new camera I had ordered had been delivered. However sods law dictated that they would choose the half hour that the house was unoccupied. This means I will have to pick it up tomorrow on the way to my groundhop at Moneyfields. I didn’t have a huge amount of time before I had to leave and I spent this having a bath, having lunch, doing some research for my blogs and catching up online though this was a bit restricted as Facebook was not working properly. I left at 3 and true to form the roads were awful. Before I'd even got to Chris in Milton Keynes there was 15 minutes delay due to a closed road. I met him just after 4 and before we'd even got on the M1 there was an announcement of a 90 minute delay further up due to an accident so we got off at Daventry and went cross country to cut out the delay. Our diversion has delays too and we had a few minor issues further up so in the end we were delayed by 45 minutes. 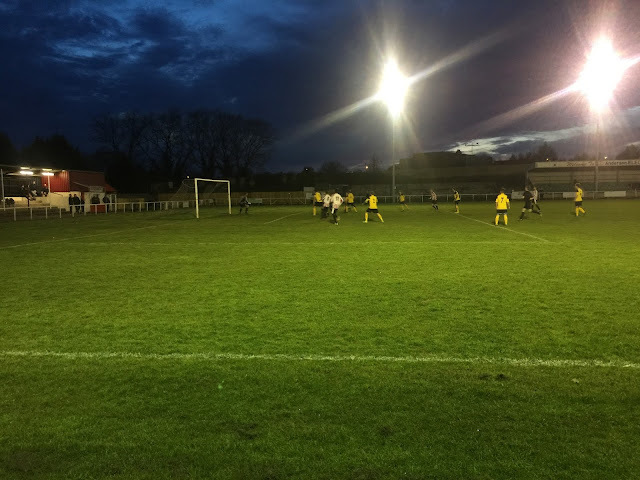 We got to the ground at 6.15 and after drawing a blank on grabbing an early programme we made our way to the Wilmot Arms who happened to be Borrowash's main shirt sponsor. 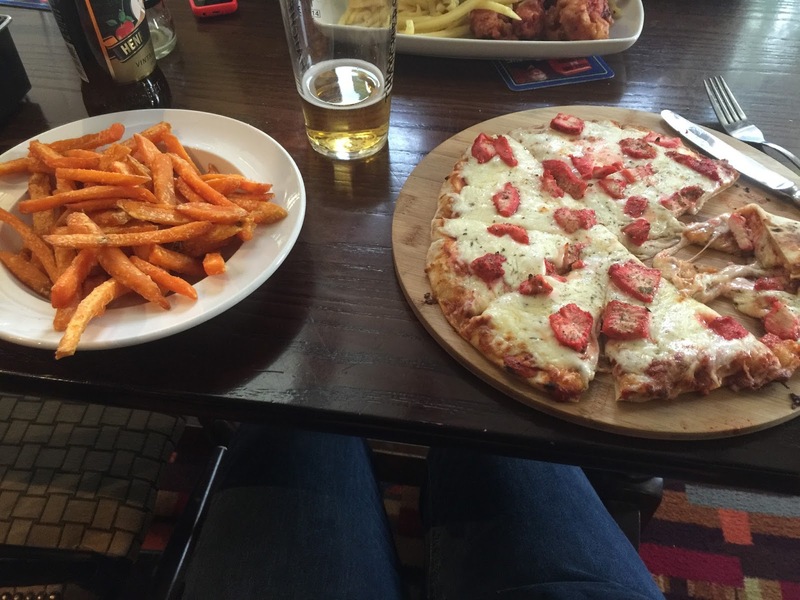 Chris had a Tikka naan and chips while I had something unusual in a chicken Tikka naanitza and sweet potato fries. To wash it down we were both on the cider with me having a Henry Weston 2014 vintage which was a new try and very nice. The food took a while to come but it was very nice and well worth the wait. From there we went to the ground, arriving with 20 minutes until kick off. I got some pictures of the of the ground before taking up a spot along the side. The game started with few chances but with the hosts slightly on top. However it was Stapenhill who took the lead on 20 minutes when a parried shot was followed up from close range to put them ahead. Just before half time they doubled their lead as their number 11 curled a shot into the bottom corner from around about the penalty spot. They probably deserved the lead but maybe not by 2 goals. The hosts pulled one back on 68 minutes when a soft penalty was awarded for a foul in the area. The spot kick was powerfully put away to halve the arrears. Although it petered out into a typical end of season game at times, the last 20 minutes were a bit more exciting and passed fairly quickly. As with the journey there, the return leg was beset with delays. First on the M1 near Rugby it was closed for a junction and the diversion was clogged up. Then our alternative route on the M6 didn't allow us to get back on the M1 so we had to go down the A14 and cross country. Finally there was a big batch of 50mph speed cameras through the roadworks so all in all it added 40 minutes to the journey - not ideal when you are up for work at 4am. I dropped Chris off at 11.30, getting back home myself 50 minutes later. I watched TV for an hour before going to sleep around 1.30 am. 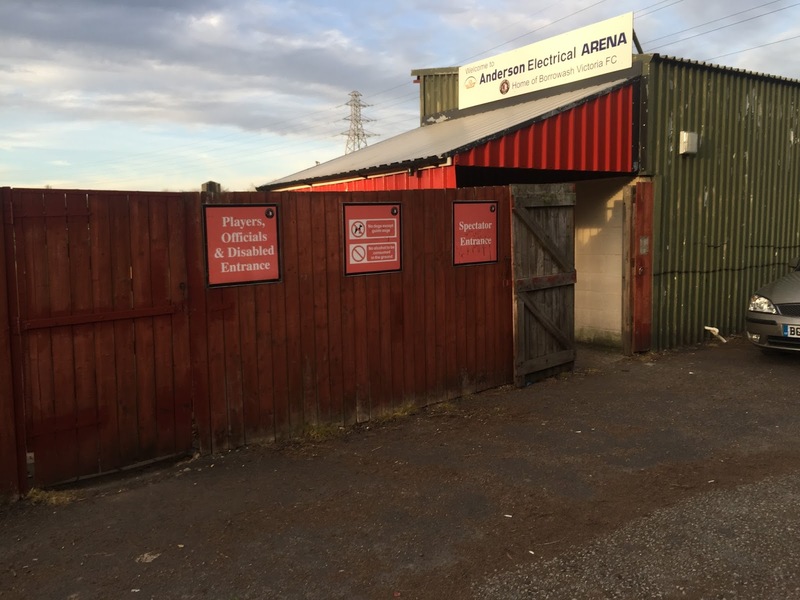 The ANDERSON ELECTRICAL ARENA has had several different names over the years and is a ground I first visited back in 2007. The ground has a reported capacity of 5000 thanks to the bowl like grass banking. There is seating for 250 with covered standing accommodation for around the same amount. There is a bar and a tea bar at the ground, though I didn't use them on the night, they looked reasonable. Instead I went to the Wilmot Arms and had a very nice dinner. Prices are reasonable and there are also a decent selection of drinks available.